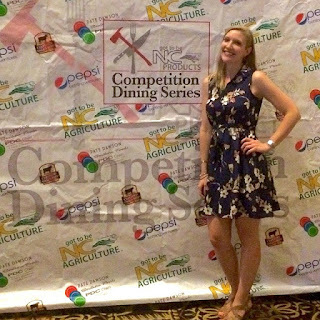 Got to Be NC Competition Dining is one of my favorite events of the year. I’m always thrilled to partner with them and believe in their mission of strengthening farmer and chef relationships, and putting small, locally-owned farms and food businesses on the map. Founder and Host Jimmy Crippen told me several stories last week of how this event has saved several businesses and quadrupled the size of others. And I’m always intrigued as to how they select their secret featured ingredients! When FRESH ORGANIC HERBS from Windcrest Farm Organics was announced, I squealed with delight. I just planted my herb garden, so you can imagine the mint and oregano that’s been growing out of my ears. I was so excited I couldn’t stand it! 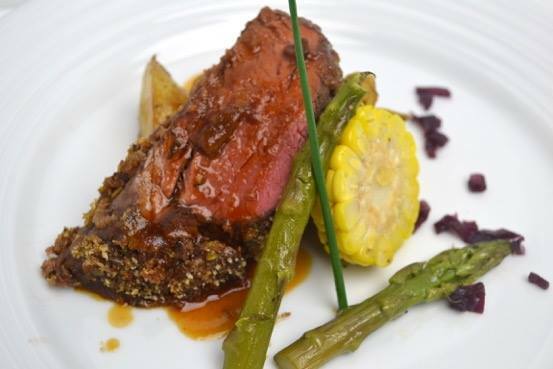 The Benton Convention Center in Winston-Salem has proved to be a wonderful new host site for Competition Dining, where competitors for Battle #2 included Chef Dion Sprenkle from Chef Dion Sprenkle in Lexington and Chef Matthew Montandon from The Phoenix in Brevard. The timing and pace of the evening was perfect. Let the courses begin. 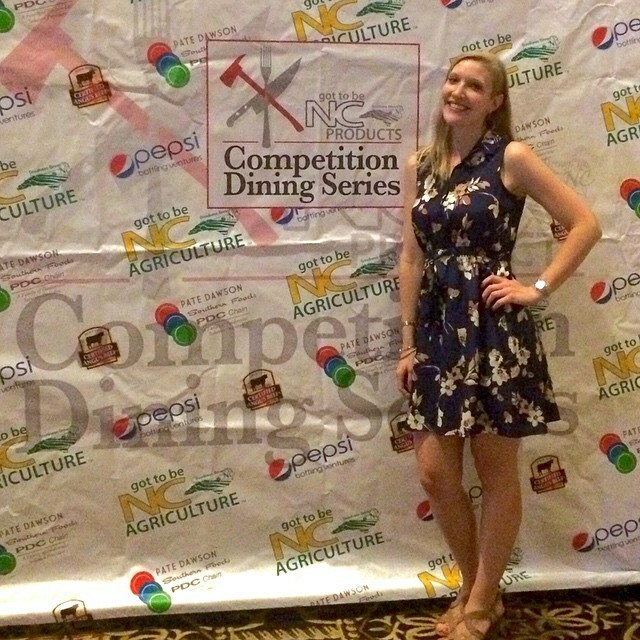 *Special thanks to Grace Riddle at NC Competition Dining for the wonderful photos! And start out with a bang they did. 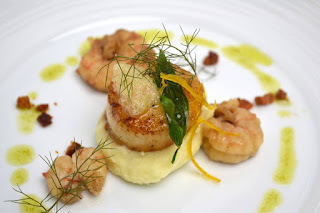 Course # 1: A Cast Iron Skillet Scallop (cooked perfectly), with Sweet Cream-Black Garlic Poached Royal Red Shrimp (also cooked perfectly) atop a Parsnip Puree, Benton's Bacon, WFO Bronze Fennel, Olive, Fried Lovage Leaves, Lime Caviar and Orange Confit. (How do they fit this all into one dish, you ask? I wonder the same thing!) The poached shrimp couldn’t have been more juicy and tender. 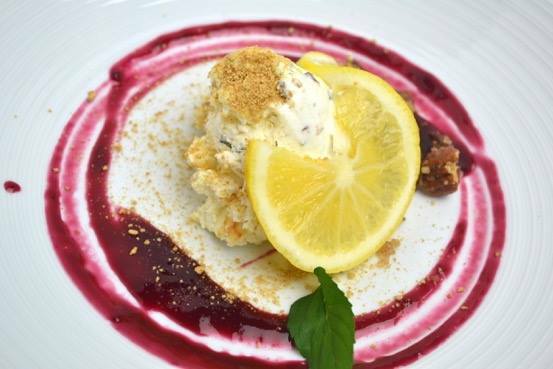 Lime Caviar is a hot commodity these days – appearing as a lime on the outside until you open it and surprise! - little caviar bubbles! This was a perfect pop of acid and possibly my new favorite summer ingredient. Though the WFO Herbs weren’t the most exciting thing on the plate, the Fennel paired nicely with the shrimp, and the Lovage brought a lovely bitterness to match the Parsnip Puree. The second course was perhaps my favorite of the night, because it hit on such a sweet and savory flavor combination and was reminiscent of breakfast! The aroma was sensational. 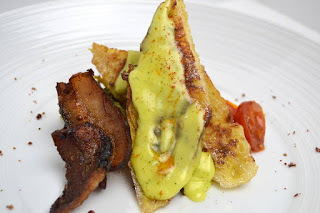 La Farm Bakery's White Chocolate Baguette French Toast had a wonderful touch of sweetness, and was covered in a rich WFO Dill-Duck Hollandaise sauce. I even detected some Truffle flavor, which I would certainly never argue with. It was succulent. On the side, Tomato Confit melts in your mouth. The Brussel Sprouts are salty, balsamic goodness – the best I’ve had in my life. These are no long the boring, overlooked, obligatory green vegetable at Thanksgiving. Some Brussel Sprout fairy worked his (or her) magic on these. Would you even believe I preferred these to the Heritage Farms Cheshire Pork Belly? I would order this for any meal in a heartbeat. Course #3 perhaps strayed a little too far from the garden. Calasparra Paella had an overpowering flavor - a little heavy-handed with Saffron? Or maybe a dash too much of the WFO Oregano? It unfortunately lacked balance. The trio of sausages (San Giuseppe Spanish Chorizo, Merguez, Campofrio Sausage) was perfect, and the cook of the rice was on point. 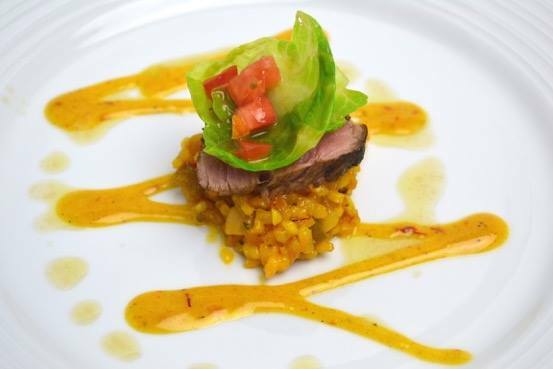 The Brussel Sprout and Tomato salad was a necessary tang and a nice pop of color, and the Veal Tenderloin that rested atop was cooked perfectly. Had the Saffron and Oregano been a touch lighter, this dish would have knocked peoples’ socks off. leaves would have made it exceptional. This sweet tooth gal was ready for her dessert. TWO COURSES of dessert at that! There’s always an interesting debate between tablemates: do you want two more savory courses, or two sweet ones? (MY vote is easy!) 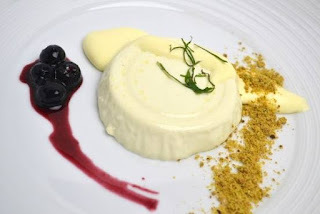 WFO Lavender Mint Panna Cotta is the most delightfully refreshing palate cleanser. This is what you want to end a meal on. It’s quite an undertaking to present this gelatinous-based custard and attempt to keep the consistency, but mine still had the jiggle you look for! There was a nice bite from the Passion Fruit Zabaglione and Fermented Blueberries, with Toasted Pistachio Dust breaking up the creaminess. This was a well-rounded dish. Bring on more dessert, please. With Chef John Milner, Chef Dion Sprenkle and his team! ...and Chef Sprenkle walks away victorious! He'll battle on June 15 against veteran Competition Dining Chef John Bobby from Noble's Grille (read about the evening I feasted at Chef Bobby's Battle: Ostrich!) I'll be at the table on June 15th to see who takes the lead. Want to join me and be my date?! Of course you do! CLICK HERE TO PURCHASE YOUR TICKET! Until then, stay hungry!